Thursday, May 16, 2013 ratings — New Episodes: The Office, Hannibal, American Idol, Wipeout, Grey’s Anatomy, Scandal, The Big Bang Theory, Elementary, The Vampire Diaries, and Beauty And The Beast. Reruns: The Big Bang Theory. 8pm – Wipeout: 1.0 in the demo with 3.82 million. 9pm – Grey’s Anatomy: 3.0 in the demo with 8.63 million. 10pm – Scandal: 3.2 in the demo with 9.13 million. 8pm – The Big Bang Theory: 4.4 in the demo with 14.78 million. 8:30pm – The Big Bang Theory: (rerun) 3.2 in the demo with 11.64 million. 9pm – Elementary: 2.0 in the demo with 8.93 million. 8pm – The Vampire Diaries: 1.0 in the demo with 2.20 million. 9pm – Beauty and the Beast: 0.5 in the demo with 1.34 million. 8pm – American Idol: 3.4 in the demo with 13.61 million. 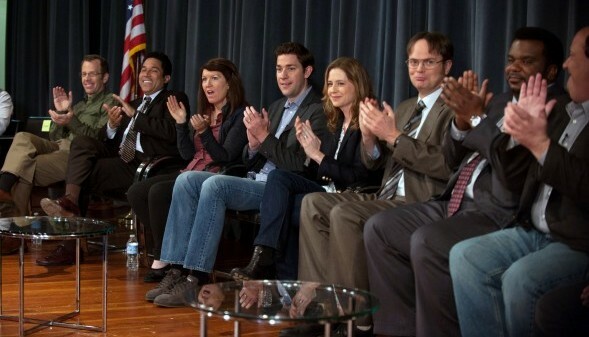 8pm – The Office: (retrospective) 2.0 in the demo with 4.37 million. 9pm – The Office: 2.9 in the demo with 5.41 million. 10pm – The Office & Hannibal: 1.7 in the demo with 3.52 million. hated that Elementary was on at 9 conflicting with The Office finale. dumbnuts could’ve waited til 10 and got bigger ratings.